There are many websites that have polls on their front page where users (anonymous and members) give their opinions. You should also have noticed that although you are an anonymous user, you are not allowed to vote more than once. In this article, we will look at how to design a polling system, having a back-end to insert new polls along with their answers as well as how to process and store the votes of the users. There are many approaches to problem solving. One of them is the bottom-up approach. That is, we will begin to design the tables, write down the stored procedures that will interact with the tables and finally the remaining UI logic. 2) Displaying the current active poll. 3) Accept a vote from the user and recording the vote. We shall add a database (.mdf file) directly to our solution for simplicity. So, open Visual Web Developer 2005 Express edition and create a new website and call it "Polls". 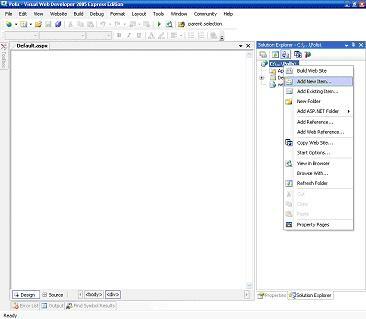 To add the SQL database file, right click on the project and click on "Add New Item". Then select "SQL Database" and name it "Poll.mdf". Figure 2. Selecting a database file and naming it "Poll.mdf"
Next comes the definition of the tables as shown in the diagrams below. Figure 4. Table "PollOptions" with "PK_OptionId" as primary key and "FK_PollId" as a foreign key referencing the primary key "Pk_PollId" in the "Polls" table. Figure 5. Table schema representing the tables' definitions. Pay attention to the primary and foreign key. Stored procedures will be used to implement the functionalities discussed earlier. 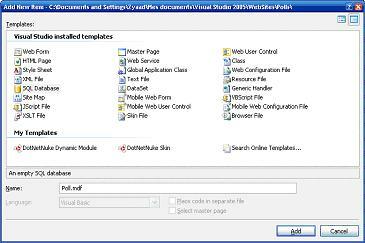 Right click on the Stored Procedures subfolder and select "Add New Stored Procedure". The algorithm to put an active poll is to first set all the polls as inactive and then insert the active one in the Polls table, as shown in the stored procedure below. The input parameter @v_Question is the text describing the question of the poll. Secondly, the options for the poll need to be linked with the question itself. This is done by the following store procedure, using the id of the active poll. 2)	Displaying the current active poll. The following stored procedure will retrieve the current active poll as well as the options linked with the poll. The stored procedure will return a dataset containing 2 tables, based on the 2 SELECT statement, the first containing the question and the second table containing the options. Recording a vote is simple. The only thing that has to be done is to increment the number of votes for the option that was selected. The stored procedure below illustrates how this is done. The stored procedure takes as parameter the option of the poll that was selected. The logic of preventing more than 1 time vote per poll will be explained later in this article. Below is the screen design where the poll would be input. The various options will be separated by the enter key and processed accordingly. Clicking on the "Update Poll" button will set the poll as the active one with all the options. The following code illustrates the idea. Firstly, the question is added to the table and then the options, in that order. Finally the function addPollOptions is called to add one by one the options to the table. The screen below is the voting screen that allows the user to select an option for the poll and click on the vote button. Figure 6. Screen showing how the options will look like for each poll. A button is also supplied for voting. To display the poll, a label and a radiobuttonlist are used. The label"s text is bounded with the question and the radiobuttonlist bounded to the options, both obtained from the stored procedure "GetActivePoll". The following code snippets do the job. First, the active poll is retrieved from the table and stored in a dataset. Next, the poll is bounded with the label and the radiobuttonlist. If the vote is considered as a first time vote, the cookie is updated and the number of votes for that option incremented as illustrated by the function below. The id of the option is passed in the stored procedure and is obtained from rdoPollOptionList.SelectedValue. In short, this tutorial explained about using stored procedures, cookies and binding data to various controls. Based on this example, many things can be achieved: live polls on websites, questionnaires etc... It is up to you to let your imagination flow.